Join Sessay Bowls Club now and enjoy free membership for the first year. Make new friends. Learn new skills. Free coaching. Social and competitive bowling. After bowling, enjoy a drink in the bar. Lovely village setting, overlooking the white horse. Bowls is the sport for all - everyone welcome - come and gitve it a try. First 20 applicants will enjoy free membership for the first season. Membership is offered on a first come first served basis. Offer expires after 20 new members have enrolled. 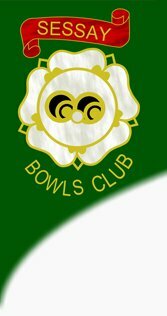 To apply, complete the form below, or Email chairman@sessaybowlsclub.info. We also pay a match fee of £1.50 per game for most league fixtures.